Your scored -5.5 on Moral Order and 3 on Moral Rules. On Non-Fiscal Issues, you rank as a Strong Liberal (7). On Fiscal Issues, you rank as a Strong Liberal (17). Last edited by oblivion; 20th January 2012 at 03:18 AM. I haven't taken any of those for a while, and don't have time right at the moment, but I will later. Sneak preview: All political tests, always, show me to be on the Libertarian Right. IIRC, the Political Compass showed me pretty close to Milton Friedman. And that's about right. I'd love to, but I have problems with the last three links you provided: "connection reset", "bad request", and at best a site with lists to other sites. I don't really understand politics as well as I should, and some of the questions were a bit tough to answer in the limited way allowed. Plus, being out of the US, I had to tackle fresh the idea of a 'one-party state' with only a fuzzy idea of US political divisions. sorry about that. I've removed the dead links for now. will have to re-find the quizzes. the fire and ice one in particular was interesting. I'm two to the right of redunderthebed. I loathe that political compass, with all due respect. Left is libertarian, Right is authoritarian. Last edited by divagreen; 20th January 2012 at 07:36 PM. 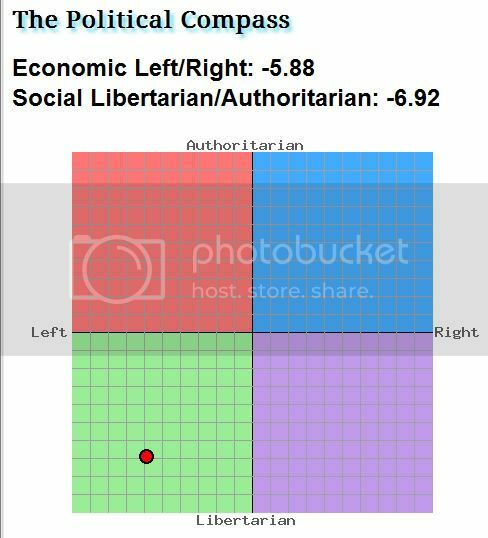 Jesus christ I am the most conservative member. You'll be OK. Just wait for Jerome da Gnome to do the quiz. Who has the skills to post a running chart of the members?